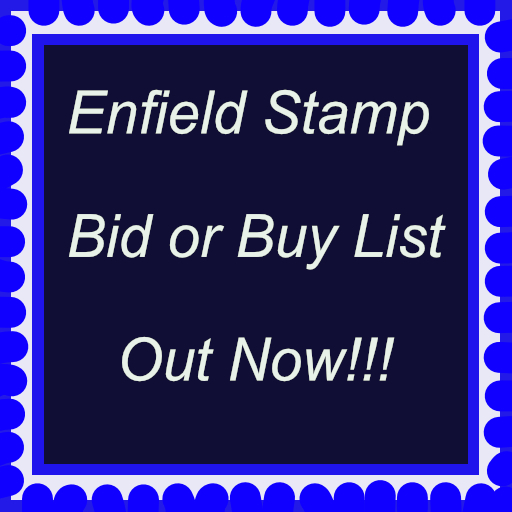 Enfield Stamp Bid or Buy List 441 - Enfield Stamp Company Ltd.
Work is progressing on Eric’s collection. With David back for a couple of days we have been able to process more albums. These include Bulgaria; Finland; German Zones,West & Berlin with a truly remarkable cover (lot 117), G.B. QV. 1841 1d. reds in quantity; Hungary; Iceland; India with extraordinary Sikkim Rocket Mail items; large ranges of rarely offered Italian Occupation of Dodecanese Islands; New Zealand; and Russia. Brenda and I have finalised our holiday dates. They are Sept.24th to Oct.5th inclusive. The shop will be closed during that time although Gemma and the team will still be in the office processing orders and taking enquires. So the shop is open up to Sept. 22nd. and reopens on Oct.6th. 2 Schoolboy’s coll.in Everyland album,(dated 1944 & 1956),all M.
4 Schoolboy’s coll.in well filled c.1960’s Everest album(Rapkin). 6 Countries A-H,predom pre 1950,M.& U.coll.in old Simplex L.L. to drivers,then famous cars,ending with special photographic P.C. 33 1964-65 Wmk.block CA.M.range to 2s.,inc:1s.& 2/25c.,good to fine. 36 1963-C.1977 UM.Comms.coll.on Hagner leaves,inc:many sets,fine. 42 G.V,predom U.,Comms.range on St.card inc:1931 Airs,1931 6d. 45 C.1960-99 accum.of Comms.& Defins.on illus.FDC’s on cards,fine. 48 Q.V.range,U.,comp.Chalon 1d.(6),4d.(2),1s. (2),1884-90 1d.,2 1/2d. 53 All periods to about 1980’s M.accum.on St.page in no order,vals. 58 1949-92 U.,few M.,Comms.& Defins.coll.neatly arranged on St.
64 & Guyana:Predom G.VI & Q.E.II,few earlier,mainly U.coll./accum. 77 1937 M.set to 12a inc:both shades of 3 1/2a.,some with dup.,good. 81 1851-1981 SG.Davo One Country printed album(like new)with UM.,M. 84 1937-70 M.Comms.& Defins.coll.on leaves inc:1949 set to 3s.(C. 91 All periods,mainly earlier,M.& U.range on St.leaves,fair to fine. 92 All periods to 1940’s M.& U.coll.on pages inc:1942 set M.(SG. 95 G.VI & Q.E.II M.or UM.accum.on Hagner page inc:1938 1/2d.to 1/3d. 100 1950-55 UM.coll.on neat pages set out by issue date,mostly in bl. 102 Earlies to mainly 1960,few later,all periods Comms.& Defins.U. leaves,with a good range of Sowers,etc.,some Cols.at rear,good. 106 1853-58 1k.,3k. (both Cols.),6k. (2 shades)U.,all 3/4 marg. 108 1948 Leipzig Spring Fair 50Pf.in full sheet of 25,generally good. 109 1947 Leipzig Autumn Fair set in full sheets of 25,generally good. 110 1947 Leipzig Spring Fair set in full sheets of 25,generally good. 112 1980-94 UM.or M.virtually complete Comms.& Defins.coll.in L.H. 113 1995-2001 apparently UM.Comms.& Defins.coll.in L.L.hingeless Vol. 120 Q.V.-Q.E.II M.& U.range on St.page & leaves inc:G.VI with 1 1/2d. 123 1948-53 M.coll.on leaves inc.1948 to 2s.,1948 RSW.set,1949 UPU. 3d.,1918 War Tax 1d.,1921-24 1/2d.to 2 1/2d.,1s.,2s.,5s.,fine. 129 Q.V.1/2d. (5),Edw.L.Vals.to 9d.,G.VI & Q.E.II U.issues on St.
136 1841 1d.(6),2d. (3)U.,mainly 3 marg.,one 2d.four M.examples,good. 139 1841-70 U.range on page comp.1d. (3),1s.embossed(four marg.),1d. 145 Fifty-one examples(inc:4 pairs,strips of 4 & 5 & four singles U. 156 Small range comp.Pl.1,3,6,8,10,12,14,15,also Pl.5(pair),U.,good. 158 Pl.1 to 20(No.9)U.range with 2 add.shades,on page,generally good. 159 1/2d.(2),1d. (Unused),1 1/2d.,2d. (Unused & U.Perfin)5d.,also 1d. 161 2/6d.lilac(2)on page with 1d.lilac,14 dots(2),16 dots(3),U.,good. 172 1924 Block Cypher set,1934 Photo set,1929 PUC L.Vals.,1935 S.J. 178 Dup.U.ranges of Defins.,with a few Comms.& Defins.1953 Coro. 179 Predom 1953-1992 almost all U.Comms.& Defins. (few)range on St.
180 1974 BRITISH ARMY ENTRY/WHITBREAD Round The World Race:Six illus. 194 1993-5 small U.MS.range on St.page,Philatelic Bureau Pmks.,fine. 198 1953-70 M.range of sets on St.page inc:SG.216-7,242-3,245-6,good. 200 Q.V.-G.V M.& U.ranges on leaves & loose on St.card inc:1891 20c. 201 1971-85 U.Comm.sets & part sets coll.on St.leaves,fair to fine. 205 1945-6 M.& U.Ovpt’d issues on neat pages inc: “Pengo” sets M.& U. 209 1951 Hungarian Postage Stamp Anniv.set in UM.blocks of 4,fine. Edw’s.to 1r.,G.V issues,I.E.F.,many Officials,with vals.to 1r. 244 Leros:1912-30 M.coll.on page inc:1930 Ferrucci set & 1912-21 20c. 259 Simi:1912-30 M.coll.on page inc:1930 Ferrucci set & 1912-21 20c. 261 Stampalia:1912-30 M.coll.on page inc:1912-21 20c.orange Wmk’d(SG. 272 All periods to 1974 M.& U.coll.on album pages inc:1896-1901 U. 275 1951-92 mainly earlier,M.& U.,Comms.& Defins.coll.on leaves & St.
276 1902 1/2d.to 1s.,1907 1/2d.to 1s.,5s.,with extra 2 1/2d.shade,M. 285 1891-1986 M.& U.coll.on album pages,inc:1891-94 Tigers 1c.& 5c.U. 286 All periods,predom U.ranges on leaves inc:1891-95 Tiger set(C.
287 1949-1980 U.coll.on pages inc:1949 UPU.set,1954 Q.E.II set(SG.C. 289 1881-1980 mostly U.coll.on album pages inc:1891 Tiger set U.(SG. 294 1939-40 M.& U. (3)range on St.card inc:1934-35 3f.on 16f.(M.C. 305 1953-2007 U.coll.Comm.& Defin.album pages inc:1965 Fruit set U. 318 1925-28 Hut issues to 6d. (three shades)M.,on page,good to fine. Surchs. (C.£14),1953 set to 5Fr.,1957 to 5Fr.,many later Comm. Coast Ariways,Dragon Rapide used by Cook Strait Airways,Pan Am. G.V Heads,Postal Fiscals to £1,G.VI Officials,etc.,fair to fine. 335 Officials:1936-42 M.range of issues to 1s.,var.diff.Perfs.,comp. 338 VARIETIES:1938-42 ISSUE:Small M.range of blocks & singles comp. 357 1937-1980’s M.(odd U. )coll.on Hagner,dup.in places,many Comm. 360 1940-80 M.range on St.page inc:Q.E.II to $2(2),etc.,good to fine. 361 1940-80’s M.coll.on St.pages inc:1940-51 vals.to 2/6d.,1949 UPU. 387 1934 Meadelev,Anti-War,Underground & Eagles set,U.,on page,fine. 415 1941-2 covers with 1941 set FDC. (SG.1-7 C.£35),1941 Arms set FDC. 423 1903-22 M.& U.range on Hagner inc:1903 2s.& 2/6d.U. (SG.8 & 9 C.
425 1862-1883 M.(5)& U.range on part page & St.card,Comp.1862-78 1d. 436 1920 Victory set,1921 Hut 1/2d.,1d.,2d.Perf.14×14 1/2,1/2d.to 1s. 450 1937-53 small M.range on leaves,inc.1948 RSW.set,UPU.,etc.,fine. 470 Modern U.Setennant panes & blocks range on St.leaves,with Defin. 480 1863-92 M.& U.coll.on St.page & page inc:1887-91 U.range to 64a. 483 1889-1908 M.range of Ovpt.on written up pages inc:1889 SG.20 M.
484 1883-1939 M.& U.coll.on Hagner & page inc:1883-85 I Salung U.(SG. 489 All periods to about 1980’s M.& U.coll.on St.page inc:1901-06 5s. 490 1952-1980’s M.(3 G.VI U)coll.on St.page with some Comm.sets,good. 491 All periods to 1990’s M.& U.coll.on St.page inc:1893-5 4d.& 5d. 494 1921 to 1s.,1922-26 1/4d.,1d.to 4d.,5d.,6d.,1s.,2s.,script,3s. 495 INTER-ALLIED COMMISSION:1920 C I H S. Ovpts.,small U.range on St.
515 1966 Comms.coll.on leaves,UM.,all in blocks of four,very fine. 520 1968 UM.Comms.coll.,almost all in blocks of four,very fine.